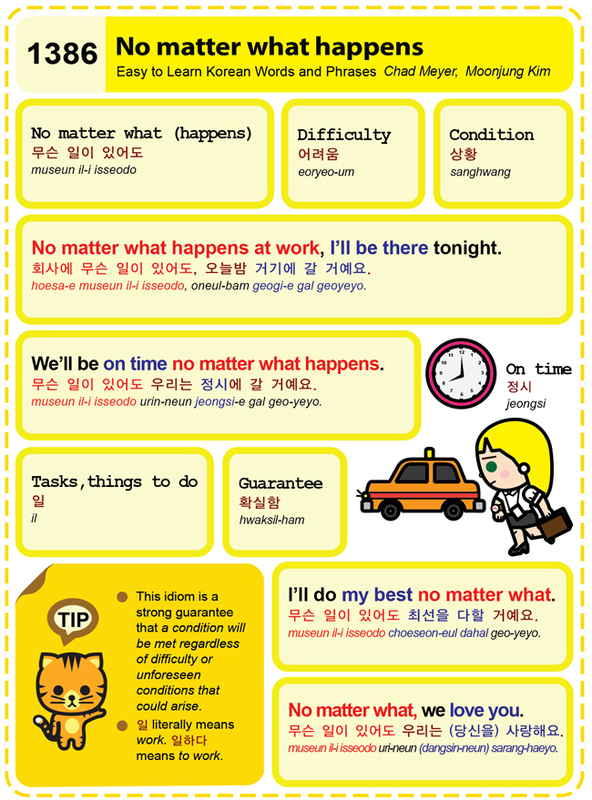 Easy to Learn Korean 1386 – No matter what happens. This entry was posted in Series and tagged condition, condition will be met regardless of difficulty or unforeseen conditions that could arise., difficulty, guarantee, I’ll be there tonight., I’ll do my best no matter what., no mater what happens, No matter what, No matter what happens at work, on time, tasks, things to do, we love you., We’ll be on time no matter what happens., 무슨 일이 있어도, 무슨 일이 있어도 우리는 (당신을) 사랑해요., 무슨 일이 있어도 우리는 정시에 갈 거예요., 무슨 일이 있어도 최선을 다할 거예요., 상황, 어려움, 오늘밤 거기에 갈 거예요., 일, 일하다, 정시, 확실함, 회사에 무슨 일이 있어도 by easykorean. Bookmark the permalink.